Learn the secrets and be prepared while caring for your aging parents so this doesn't happen to you. There are certain steps you need to know about caregiving and saving your parent's assets and you can learn these steps by downloading your REPORT today 'Discover The Estate Recovery Secret'. 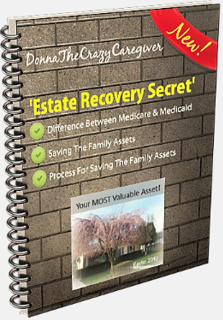 Download Your 'Estate Recovery' Report Now! Start Learning Now What You Need To Know About The Estate Recovery Program. Simply enter your best email address below to get immediate access to 'Discover The Estate Recovery Secret' TODAY and start your Caregiving Journey on the right path. Don't forget I'm throwing in 3 bonuses for you.